Race Officer Nigel Glanville – fresh from his good result the previous Saturday in the Silver Sunbeam race, set a series of good courses in a fickle westerly 4–12 knot breeze that flicked up and down and around like a delinquent yoyo. In the absence of Met Officer Jelliss (wasn’t it quiet?) 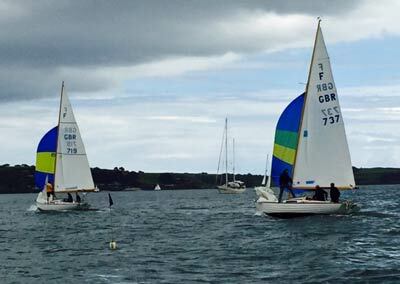 – Nigel described the weather in the race log as “white clouds–no rain;” he forgot to mention that the Carrick Roads was sparkling. In all 26 boats came to the start line showing that summer sailing as well as the meteorological summer had well and truly started. In Q class Atalanta put in her first appearance and after some re-learning of where the marks were in the Roads finished first on the Club line with all of the crew appearing to be happy to be back on the water. The competitive U Class mustered 8 starters and with a running start Aurora was first to pop her kite and led over the line followed by Aries and a trio of GK24s, the Flying Fifteen (Wild Affair) of newly-weds Abi and Mark Rickard and then Ron Jones in his smart Intro 22 Deep Purple (but she is blue?*). It was good to see the GK24s each with more crew on board but in their race within their own fleet let Aurora break away in to clear air on the run down to Water Tower, then a short little beat to Vilt where Aurora got lifted, the rest of the fleet got headed and Aries got buried. After a run down to Rustler where some of the fleet headed wrongly for a water-ski mark and a fetch to Governor the wind had unfortunately swung and led to a long fetchy/reachy/beaty leg to the now tiny St Just mark – it might now comply with international navigational standards but is a real swine to find against the black tide line of Messack Point. On this leg Abi and Mark in Wild Affair started to gain ground on Aurora and in the pack Wilkie started to move ahead of Popincoota and Kaimana while Deep Purple was looking for a clear lane in better wind. After a long starboard beat back to Trefusis Point the Penryn River finally allowed some good tactical beating with some snakes and ladders to be encountered. Sensibly the Race Officer shortened the class to a second round of Water Tower and the horribly wind shadowed windward mark of Sunbeam. Aurora and Wild Affair had a good tussle up the harbour trading tacks and the lead. Aurora won well on handicap in both IRC and Byron with Wilkie second on IRC with Kaimana third on IRC. Wild Affair, with no IRC rating, came second on Byron, in front of Wilkie, then Kaimana and Deep Purple (whose IRC certificate appeared after the start of this series), followed home by Popincoota and Aries. The garrulous old Gaffers had an enjoyable race by all accounts. Their race went from the Club to Water Tower to Sunbeam followed by a shorter lap to Vilt and back. Mike & Michelle winning in Miss Agnes by a minute and a half from Alan Perham and crew in Clementine followed by Katy who had had a good old luffing match virtually right up into the Pendennis Superyacht Basin. Charm came in fourth. Undoubtedly G Class won the smiling, cake eating and tea drinking league in the Clubhouse after racing before retiring for an early night with slippers and cocoa. Eight working boats came to their start line in the lower harbour where Race Officer John Maunder was in charge of the Grace & Gebhard Cup races. All flew their topsails with Florence sailed by the Roseland Syndicate winning by 48 seconds on handicap after a 130 minute race. Winnie was a well deserved second followed by Cousin Jack sailed by Peter Searle. Surprisingly neither Rita nor Demelza were in the chocolates on this occasion but would undoubtedly have been in amongst the beer at the prize-giving in the Working Boat Bar afterwards. The sole C class representative was Leila sailed by Adam Bird. Although in C class, when there are fewer than three in the class, they race with the rest of B class. W Class was won by Len Cheshire and his gang on Sweet Friday and was joined by a very welcome new entrant Galine, sail number TL6, sailed by new Club member James Smith. Galine is a Teal design built at the famous AR Luke boatyard on the Hamble in 1934, and is a beautiful addition to the Club fleet. Thanks to Race Officer Nigel – great to see you in the Clubhouse, Sue & Tim serving Mandy & Rebecca’s marvellous cakes, Inez recording and scoring, the Commodore behind the bar and Giles on the Club Launch.